"Shantung" redirects here. For the fabric, see Shantung (fabric). For the street in Hong Kong, see Shantung Street. For the subdistrict in Chongqing, see Shandong Subdistrict. 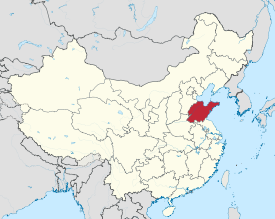 "East of the Mountains (Taihang)"
Shandong (山东; formerly romanised as Shantung) is a coastal province of the People's Republic of China, and is part of the East China region. Shandong has played a major role in Chinese history since the beginning of Chinese civilization along the lower reaches of the Yellow River. It has served as a pivotal cultural and religious center for Taoism, Chinese Buddhism, and Confucianism. Shandong's Mount Tai is the most revered mountain of Taoism and one of the world's sites with the longest history of continuous religious worship. 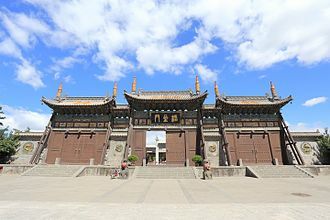 The Buddhist temples in the mountains to the south of the provincial capital of Jinan were once among the foremost Buddhist sites in China. The city of Qufu is the birthplace of Confucius, and was later established as the center of Confucianism. Shandong's location at the intersection of ancient as well as modern north–south and east–west trading routes have helped to establish it as an economic center. After a period of political instability and economic hardship that began in the late 19th century, Shandong has emerged as one of the most populous (95,793,065 inhabitants at the 2010 Census) and most affluent provinces in the People's Republic of China with a GDP of CNY¥5.942 trillion in 2014, or USD$967 billion, making it China's third wealthiest province. 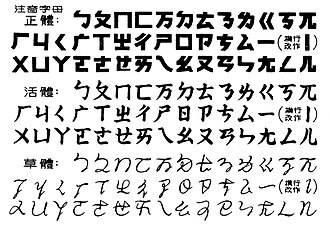 Individually, the two Chinese characters in the name "Shandong" mean "mountain" (山) and "east" (东). Shandong could hence be translated literally as "east of the mountains" and refers to the province's location to the east of the Taihang Mountains. A common nickname for Shandong is Qílǔ (simplified Chinese: 齐鲁; traditional Chinese: 齊魯), after the States of Qi and Lu that existed in the area during the Spring and Autumn period. Whereas the State of Qi was a major power of its era, the State of Lu played only a minor role in the politics of its time. Lu, however, became renowned for being the home of Confucius and hence its cultural influence came to eclipse that of the State of Qi. The cultural dominance of the State of Lu heritage is reflected in the official abbreviation for Shandong which is "鲁" (Chinese: 魯; pinyin: Lǔ). English speakers in the 19th century called the province Shan-tung. The province is on the eastern edge of the North China Plain and in the lower reaches of the Yellow River (Huang He), and extends out to sea as the Shandong Peninsula. Shandong borders the Bohai Sea to the north, Hebei to the northwest, Henan to the west, Jiangsu to the south, and the Yellow Sea to the southeast; it also shares a very short border with Anhui, between Henan and Jiangsu. 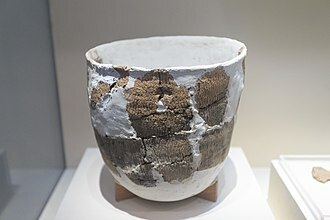 With its location on the eastern edge of the North China Plain, Shandong was home to a succession of Neolithic cultures for millennia, including the Houli culture (6500–5500 BCE), the Beixin culture (5300–4100 BCE), the Dawenkou culture (4100–2600 BCE), the Longshan culture (3000–2000 BCE), and the Yueshi culture (1900–1500 BCE). 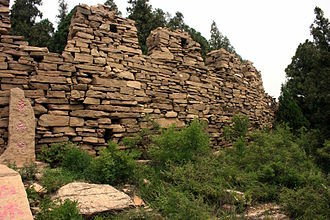 The earliest dynasties (the Shang dynasty and Zhou dynasty) exerted varying degrees of control over western Shandong, while eastern Shandong was inhabited by the Dongyi peoples who were considered "barbarians". Over subsequent centuries, the Dongyi were eventually sinicized. During the Spring and Autumn period and the Warring States period, regional states became increasingly powerful. At this time, Shandong was home to two major states: the state of Qi at Linzi and the state of Lu at Qufu. Lu is noted for being the home of Confucius. The state was, however, comparatively small, and eventually succumbed to the larger state of Chu from the south. The state of Qi, on the other hand, was a major power throughout the period. Cities it ruled included Linzi, Jimo (north of modern Qingdao) and Ju. The Qin dynasty conquered Qi and founded the first centralized Chinese state in 221 BCE. The Han dynasty that followed created a number of commanderies supervised by two regions (刺史部) in what is now modern Shandong: Qingzhou (青州) in the north and Yanzhou (兗州) in the south. During the division of the Three Kingdoms, Shandong belonged to the Cao Wei, which ruled over northern China. After the Three Kingdoms period, a brief period of unity under the Western Jin dynasty gave way to invasions by nomadic peoples from the north. Northern China, including Shandong, was overrun. 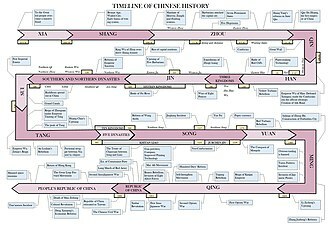 Over the next century or so Shandong changed hands several times, falling to the Later Zhao, then Former Yan, then Former Qin, then Later Yan, then Southern Yan, then the Liu Song dynasty, and finally the Northern Wei dynasty, the first of the Northern dynasties during the Northern and Southern dynasties Period. Shandong stayed with the Northern dynasties for the rest of this period. 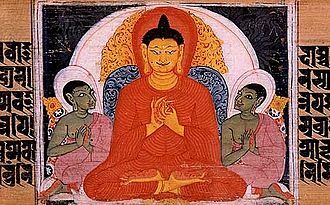 In 412 CE, the Chinese Buddhist monk Faxian landed at Laoshan, on the southern edge of the Shandong peninsula, and proceeded to Qingzhou to edit and translate the scriptures he had brought back from India. 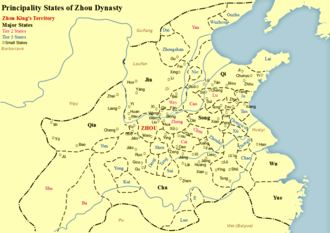 The Sui dynasty reestablished unity in 589, and the Tang dynasty (618-907) presided over the next golden age of China. For the earlier part of this period Shandong was ruled as part of Henan Circuit, one of the circuits (a political division). Later on China splintered into warlord factions, resulting in the Five Dynasties and Ten Kingdoms period. Shandong was part of the Five Dynasties, all based in the north. The Song dynasty reunified China in the late tenth century. The classic novel Water Margin was based on folk tales of outlaw bands active in Shandong during the Song dynasty. In 1996, the discovery of over two hundred buried Buddhist statues at Qingzhou was hailed as a major archaeological find. 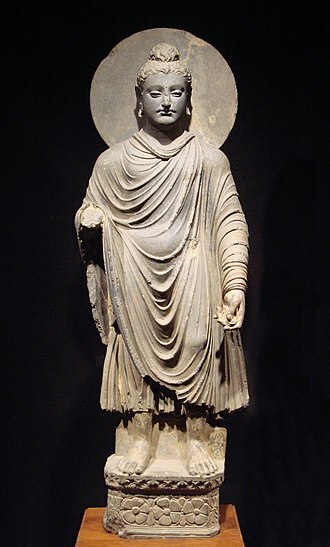 The statues included early examples of painted figures, and are thought to have been buried due to Emperor Huizong's repression of Buddhism (he favored Taoism). The Song dynasty was forced to cede northern China to the Jurchen Jin dynasty in 1142. Shandong was administered by the Jin as Shandong East Circuit and Shandong West Circuit – the first use of its current name. The modern province of Shandong was created by the Ming dynasty, where it had a more expansive territory including the agricultural part of Liaoning. After the Ming-Qing Transition in 1644, Shandong acquired (more or less) its current borders. During the nineteenth century, China became increasingly exposed to Western influence, and Shandong, a coastal province, was especially affected. Qingdao was leased to Germany in 1897 and Weihai to Britain in 1898. The rest of Shandong was generally considered to be part of the German sphere of influence. As a result of foreign pressure from the Russian Empire, which had annexed Outer Manchuria by 1860, the Qing dynasty encouraged settlement of Shandong people to what remained of northeast China. 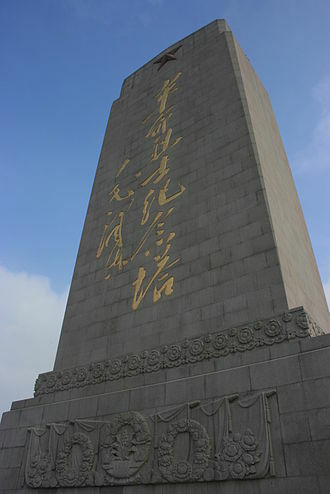 Shandong was one of the first places in which the Boxer Rebellion started and became one of the centers of the uprising. 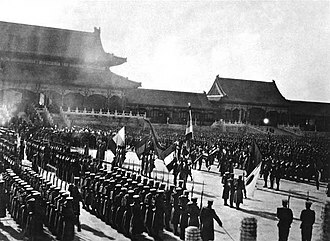 In 1899, the Qing general Yuan Shikai was appointed as governor of the province to suppress the uprising. He held the post for 3 years. As a consequence of the First World War, Germany lost Qingdao and its sphere of influence in Shandong. The Treaty of Versailles transferred the German concessions in Shandong to Japan instead of restoring Chinese sovereignty over the area. Popular dissatisfaction with this outcome, referred to as the Shandong Problem, led to the May Fourth Movement. Among the reservations to the Treaty that the United States Senate Committee on Foreign Relations approved was "to give Shantung to China," the treaty with reservations was not approved. Finally, Shandong reverted to Chinese control in 1922 after mediation by the United States during the Washington Naval Conference. Weihai followed in 1930. The return of control over Shandong fell into the Warlord era of the Republic of China. Shandong was handed over to the Zhili clique of warlords, but after the Second Zhili-Fengtian War of 1924, the northeast China-based Fengtian clique took over. In April 1925, the Fengtian clique installed the warlord Zhang Zongchang, nicknamed the "Dogmeat General", as military governor of Shandong Province. Time dubbed him China's "basest warlord". He ruled over the province until 1928, when he was ousted in the wake of the Northern Expedition. He was succeeded by Han Fuju, who was loyal to the warlord Feng Yuxiang but later switched his allegiance to the Nanjing government headed by Chiang Kai-shek. Han Fuju also ousted the warlord Liu Zhennian, nicknamed the "King of Shandong East", who ruled eastern Shandong Province, hence unifying the province under his rule. In 1937 Japan began its invasion of China proper in the Second Sino-Japanese War, which would eventually become part of the Pacific theatre of the Second World War. Han Fuju was made Deputy Commander in Chief of the 5th War Area and put in charge defending the lower Yellow River valley. However, he abandoned his base in Jinan when the Japanese crossed the Yellow River. He was executed for not following orders shortly thereafter. Shandong was occupied in its entirety by Japan, with resistance continuing in the countryside, and was one of the provinces where a scorched earth policy ("Three Alls Policy": "kill all", "burn all", "loot all") was implemented by general Yasuji Okamura. This lasted until the surrender of Japan in 1945 killing millions of people in Shandong and Northern China. By 1945, communist forces already held some parts of Shandong. Over the next four years of the Chinese Civil War, they expanded their holdings, eventually driving the Kuomintang (government of the Republic of China) out of Shandong by June 1949. The People's Republic of China was founded in October of the same year. Under the new government, parts of western Shandong were initially given to the short-lived Pingyuan Province, but this did not last. Shandong also acquired the Xuzhou and Lianyungang areas from Jiangsu province, but this did not last either. For the most part Shandong has kept the same borders that it has today. About 6 million people starved to death in Shandong during the great famine. In recent years Shandong, especially eastern Shandong, has enjoyed significant economic development, becoming one of the richest provinces of the People's Republic of China. The northwestern, western, and southwestern parts of the province are all part of the vast North China Plain. The center of the province is more mountainous, with Mount Tai being the most prominent. The east of the province is the hilly Shandong Peninsula extending into the sea; it separates Bohai Sea in the northwest from the Yellow Sea to the east and south. The highest peak of Shandong is the highest peak in the Taishan area: Jade Emperor Peak, with a height of 1,545 metres (5,069 ft). The Yellow River passes through Shandong's western areas, entering the sea along Shandong's northern coast; in its traversal of Shandong it flows on a levee, higher than the surrounding land, and dividing western Shandong into the Hai He watershed in the north and the Huai River watershed in the south. The Grand Canal of China enters Shandong from the northwest and leaves on the southwest. Weishan Lake is the largest lake of the province. Shandong's coastline is 3,000 kilometres (1,900 mi) long. Shandong Peninsula has a rocky coastline with cliffs, bays, and islands; the large Laizhou Bay, the southernmost of the three bays of Bohai Sea, is found to the north, between Dongying and Penglai; Jiaozhou Bay, which is much smaller, is found to the south, next to Qingdao. The Miaodao Islands extend northwards from the northern coast of the peninsula. Shandong has a temperate climate, lying in the transition between the humid subtropical (Cwa under the Köppen climate classification) and humid continental (Köppen Dwa) zones with four distinct seasons. Summers are hot and rainy (except for a few coastal areas), while winters are cold and dry. Average temperatures are −5 to 1 °C (23 to 34 °F) in January and 24 to 28 °C (75 to 82 °F) in July. Annual precipitation is 550 to 950 mm (22 to 37 in), the vast majority of which occurs during summer, due to monsoonal influences. With Jinan serving as the province's economic and cultural centre, the province's economic prowess has led to the development of modern coastal cities located at Qingdao, Weihai, and Yantai. Shandong is part of the Eastern Block of the North China craton. Beginning in the Mesozoic, Shandong has undergone a crustal thinning that is unusual for a craton and that has reduced the thickness of the crust from 200 km (120 mi) to as little as 80 km (50 mi). Shandong has hence experienced extensive volcanism in the Tertiary. Some geological formations in Shandong are rich in fossils. For example, Zhucheng, which is located in southeastern Shandong, has been the site of many discoveries of dinosaur fossils. A major find of 7,600 dinosaur bones that including tyrannosaurus and ankylosaurus remains was announced in 2008, and is believed to be the largest collection ever found. Tomb of the 59th generation senior descendant of Confucius, Kong Yanjin. Many generations of the senior-branch direct descendants of Confucius ruled the Qufu area as its feudal rulers. The politics of Shandong is structured in a dual party-government system like all other governing institutions in mainland China. The Governor of Shandong is the highest-ranking official in the People's Government of Shandong. However, in the province's dual party-government governing system, the Governor has less power than the Shandong Communist Party of China Provincial Committee Secretary, colloquially termed the "Shandong CPC Party Chief". This province is third richest in China and maintained close relationship with Japan and South Korea . As of 1832, Shandong was exporting fruits, vegetables, wine, drugs, and deer skin, often heading to Guangzhou in exchange for clothing and fabrics. Shandong ranks first among the provinces in the production of a variety of products, including cotton and wheat as well as precious metals such as gold and diamonds. It also has one of the biggest sapphire deposits in the world. Other important crops include sorghum and maize. Shandong has extensive petroleum deposits as well, especially in the Dongying area in the Yellow River delta, where the Shengli Oil Field (lit. Victory Oilfield) is one of the major oilfields of China. Shandong also produces bromine from underground wells and salt from sea water. It is the largest agricultural exporter in China. Shandong is one of the richer provinces of China, and its economic development focuses on large enterprises with well-known brand names. Shandong is the biggest industrial producer and one of the top manufacturing provinces in China. Shandong has also benefited from South Korean and Japanese investment and tourism, due to its geographical proximity to those countries. The richest part of the province is the Shandong Peninsula, where the city of Qingdao is home to three of the most well-known brand names of China: Tsingtao Beer, Haier and Hisense. In addition, Dongying's oil fields and petroleum industries form an important component of Shandong's economy. Despite the primacy of Shandong's energy sector, the province has also been plagued with problems of inefficiency and ranks as the largest consumer of fossil fuels in all of China. In 2011, the nominal GDP for Shandong was ¥4.50 trillion (US$711 billion), ranking third in the country (behind Guangdong and Jiangsu). Its GDP per capita was ¥42,014 (US$6,365), ranking eighth. The production of wine is the second largest industry in the Shandong Province, second only to agriculture. Geographically, the southern hills average an elevation of 200 meters (660 ft), while the coastal areas remain relatively flat. Most of the soil is loose, well-ventilated, and rich in minerals and organic matter that enable full development of the root systems. Presently, there are more than 140 wineries in the region, mainly distributed in the Nanwang Grape Valley and along the Yan-Peng Sightseeing Highway. The region produced more than 40% of China's grape wine production. Main varieties such as Cabernet Sauvignon, Cabernet Gernischt, Merlot, Riesling and Chardonnay are all at 20 years of age, considered to be the golden stage for these grapes. Most of them maintain an average saccharinity of above 20%. China Great Wall Wine Co. Ltd. Founded in 1991, the Jinan High-tech Industrial Development zone was one of the first of its kind approved by the State Council. The zone is located to the east of the city and covers a total planning area of 83 km2 (32 sq mi) that is divided into a central area covering 33 km2 (13 sq mi), an export processing district of 10 km2 (3.9 sq mi), and an eastern extension area of 40 km2 (15 sq mi). Since its foundation, the Jinan High-tech Industrial Development Zone has attracted enterprises as LG, Panasonic, Volvo, and Sanyo. 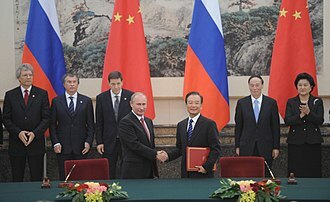 In 2000, it joined the world science and technology association and set up a China-Ukraine High-tech Cooperation Park. The Qilu Software Park became the sister park of Bangalore park of India. The export processing zone is located in the eastern suburbs of Jinan, to the east of the Jinan High-tech Industrial Development Zone and to the north of the Jiwang highway. The distances to the Jiqing Highway and the Jinan Airport are 9 and 18 km (5.6 and 11.2 mi) respectively. Approved by the State Council in October 1984, Qingdao Economic and Technical Development Zone has a planned of 12.5 km2 (4.8 sq mi). In 2004 the local GDP is ¥27.51 billion, increased by 28.9%; the total industrial output value is ¥60.6 billion, increased by 31%. There have been 48 projects invested by companies listed among the Global Fortune 500 in the zone. With the fast development of reform and opening-up, Haier, Hisense, Aucma, Sinopec, CSIC, CNOOC, CIMC etc. are all located in the zone. Qingdao Free Trade Zone was established by the State Council in 1992. The zone is 60 km (37 mi) away from Qingdao Liuting Airport. It is also close to Qingdao Qianwan Container Terminal. At present, more than 40 foreign-invested enterprises have moved in and 2000 projects have been approved. 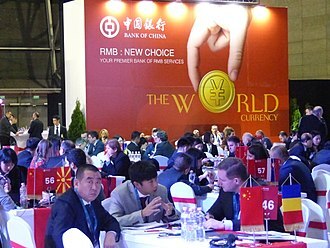 It is one of the special economic areas which enjoys the most favorable investment policies on customs, foreign exchange, foreign trade and taxation in China. Qingdao High-Tech Industrial Development Zone was approved the State Council in 1992. The zone is located close to Qingdao Liuting Airport and Qingdao Harbor. Encouraged industries include electronic information, biotechnology, medicine, new materials, new energy, advanced equipment manufacturing, marine science & technology, national defense technology. Established in August 1995, Weifang Binhai Economic & Technological Development Area (BEDA) is a national economic and technological development area approved by the State Council. Covering an area of 677 km2 (261 sq mi), BEDA has a population of 100,000. BEDA possesses a large state-owned industrial land for use with an area of 400 km2 (150 sq mi). The land can be transacted conveniently which would guarantee the demand of any project construction and provide broad development space for the enterprises in the area. Continuously, BEDA has been accredited as National Demonstration Zone invigorating the Sea by Science and Technology, National Innovation Base for Rejuvenating Trade through Science and Technology and National Demonstration Eco-Industry Park. Weihai Economic and Technological Development Zone is a state-level development zone approved by the State Council on Oct 21, 1992. The administrative area has an area of 194 km2 (75 sq mi), including the programmed area of 36 km2 (14 sq mi) and an initial area of 11.88 km2 (4.59 sq mi). Its nearest port is Weihai Port, and the airport closest to the zone is Wuhai Airport. Weihai Export & Processing Zone (EPZ) was set up by the approval of the State Council on April 27, 2000. Weihai EPZ is located in Weihai Economic & Technological Development Zone with programmed area of 2.6 km2 (1.0 sq mi). Weihai EPZ belongs to comprehensive export & processing zone. The EPZ is located 30 km (19 mi) to Weihai Airport, 3 km (1.9 mi) to Weihai Railway Station and 4 km (2.5 mi) to Weihai Harbor. Weihai Torch Hi-Tech Science Park is a state-level development zone approved by the State Council in March 1991. Located in Weihai's northwest zone of culture, education and science, the Park has the total area of 111.9 square kilometers (43.2 sq mi), the coastal line of 30.5 kilometers (19.0 mi) and 150,000 residents. It is 3 km (1.9 mi) away from the city center, 4 km (2.5 mi) away from Weihai Port, 10 km (6.2 mi) away from Weihai Railway Station, 30 km (19 mi) away from Weihai Airport and 80 km (50 mi) away from Yantai Airport. Yantai Economic and Technological Development Area is one of the earliest approved state level economic development zones in China. It now has planned area of 10 km2 (3.9 sq mi) and a population of 115,000. It lies on the tip of the Shandong Peninsula facing the Huanghai Sea. It adjoins to downtown Yantai, merely 6 km (3.7 mi) away from Yantai Port, 6 km (3.7 mi) away from Yantai Railway Station, and a 30-minute drive to Yantai International Airport. Yantai Export Processing Zone (YTEPZ) is one of the first 15 export processing zones approved by the State Council. The total construction area of YTEPZ is 4.17 m2 (44.9 sq ft), in which the initial zone covers 3 km2 (1.2 sq mi). After developing for several years, YTEPZ is completely constructed. At present, the infrastructure has been completed, standard workshops of 120,000 m2 (140,000 sq yd) and bonded warehouses of 40,000 m2 (430,000 sq ft) have been built up. Up to now, owning perfect investment environment and conditions, YTEPZ has attracted investors both from foreign countries and regions such as Japan, Korea, Singapore, Hong Kong, Taiwan, Sweden, the United States, Canada, etc. and from the domestic to invest and operate in the zone. Qingdao was part of Shandong Province until 1929; dissolved in 1949 and incorporated into Shandong Province. Weihai also known as Weihaiwei. Established in 1930; dissolved in 1945 and incorporated into Shandong Province. Shandong is the second most populous province of China, after Guangdong, just slightly ahead of Henan, with a population of more than 95,793,000 at the 2010 Census. Over 99% of Shandong's population is Han Chinese. Minority groups include the Hui and the Manchus. Shandong citizens are also known to have the tallest average height of any Chinese province. As of 2010, 16-18-year-old male students in Yantai measured 176.4 centimetres (5 ft 9.4 in) while female students measured 164 cm (5 ft 5 in). The predominant religions in Shandong are Chinese folk religions, Taoist traditions and Chinese Buddhism. According to surveys conducted in 2007 and 2009, 25,28% of the population believes and is involved in ancestor veneration, while 1.21% of the population identifies as Christian, decreasing from 1.30% in 2004. The Christians were 1.89% of the province's population in 1949, the largest proportion in China at that time. According to a survey of the year 2010, Muslims constitute 0.55% of the population of Shandong up from 0.14% in 1949. The reports didn't give figures for other types of religion; 80.05% of the population may be either irreligious or involved in worship of nature deities, Buddhism, Confucianism, Taoism and folk religious sects. Shandong is the province where Confucius was born in the year 551 B.C. Confucianism: The most well known humanity of Shandong is Confucianism. Each year thousands of people come to Shandong to visit and learn about Confucius' culture. Confucius, according to Chinese tradition, was a thinker, political figure, educator, and founder of the Ru School of Chinese thought. 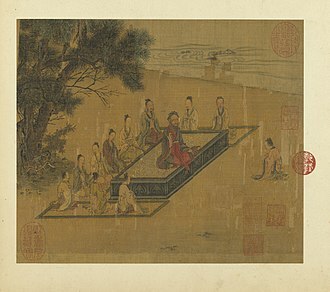 His teachings, preserved in the Lunyu or Analects, form the foundation of much of subsequent Chinese speculation on the education and comportment of the ideal man, how such an individual should live his life and interact with others, and the forms of society and government in which he should participate. Additionally, there are many famous books about Confucius; the most famous one is the Analects which was written by his students. 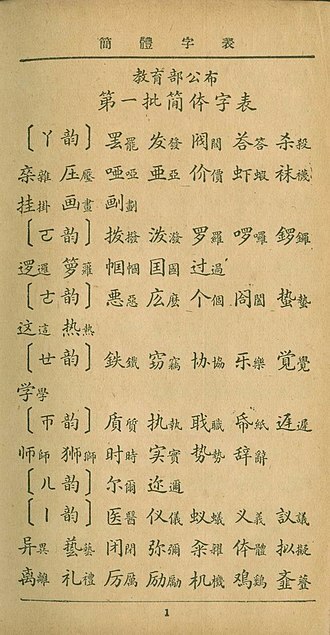 Confucius also helped edit The Five Classics (五经). The Five Classics include The Book of Songs, History, Changes and Rites. Seven Star Northern Shaolin Praying Mantis Style of Kung fu is also taught in this province. It is also said that Northern Mantis had originated here and not in the Shaolin temple in Henan Province, which is always stated in books. 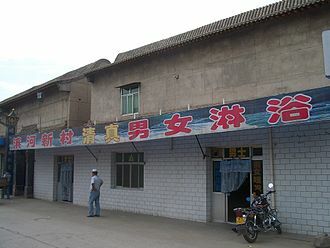 Guandi is also known for Guangong, Guanyu. He is a famous general in the book Romance of the Three Kingdoms. In Daojiao (a traditional Chinese Religion) Guangong is also one of the four Protectors. Temple and Cemetery of Confucius and the Kong is a very famous World Heritage Site in China and it is also a 5A Tourist Attraction. Lying to the east of the Temple, the Kong Family Mansion developed from a small family house linked to the temple into an aristocratic mansion in which the male direct descendants of Confucius lived and worked. The sixteen prefecture-level divisions of Shandong are subdivided into 137 county-level divisions (55 districts, 26 county-level cities, and 56 counties). Those are in turn divided into 1941 township-level divisions (1223 towns, 293 townships, two ethnic townships, and 423 subdistricts). ^ a b Laiwu PLC is currently no longer exist after census it merged with Jinan in 2019. Laiwu PLC's districts merged after census: Laiwu (Laicheng), Gangcheng; and new districts established after census: Zhangqiu (Zhangqiu CLC), Jiyang (Jiyang County). Laiwu PLC's districts and the new districts not included in the urban area & district area count of the pre-expanded city. ^ a b New district established after census: Jimo (Jimo CLC); Jiaonan CLC merged into Xihai'an (Huangdao) after census. The new district and annexed area not included in the urban area & district area count of the pre-expanded city. ^ a b New district established after census: Yanzhou (Yanzhou CLC). The new district not included in the urban area & district area count of the pre-expanded city. ^ a b New district established after census: Kenli (Kenli County). The new district not included in the urban area & district area count of the pre-expanded city. ^ a b New district established after census: Wendeng (Wendeng CLC). The new district not included in the urban area & district area count of the pre-expanded city. ^ a b New district established after census: Dingtao (Dingtao County). The new district not included in the urban area & district area count of the pre-expanded city. ^ a b New district established after census: Lingcheng (Lingxian County). The new district not included in the urban area & district area count of the pre-expanded city. ^ a b New district established after census: Zhanhua (Zhanhua County). The new district not included in the urban area & district area count of the pre-expanded city. ^ Zouping County is currently known as Zouping CLC after census. Mandarin dialects are spoken in Shandong. 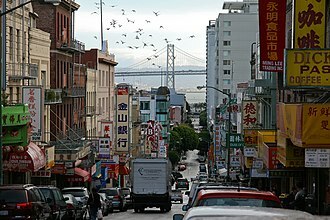 Linguists classify these dialects into three broad categories: Ji Lu Mandarin spoken in the northwest (as well as in neighbouring Hebei), such as the Jinan dialect; Zhongyuan Mandarin spoken in the southwest (as well as in neighbouring Henan); and Jiao Liao Mandarin spoken in the Shandong Peninsula (as well as the Liaodong Peninsula across the sea), such as the Qingdao dialect. When people speak of the "Shandong dialect" (山東話), it is generally the first or the second that is meant; the Jiao Liao dialects of Shandong are commonly called the "Jiaodong dialect" (膠東話). Shandong cuisine (鲁菜) is one of the eight great traditions of Chinese cuisine. It can be more finely divided into inland Shandong cuisine (e.g. Jinan cuisine); the seafood-centered Jiaodong cuisine in the peninsula; and Confucius's Mansion cuisine, an elaborate tradition originally intended for imperial and other important feasts. Shandong Bangzi and Lüju are popular types of Chinese opera in Shandong; both originated from southwestern Shandong. The Jingjiu Railway (Beijing-Kowloon) and Jinghu Railway (Beijing-Shanghai) are both major arterial railways that pass through the western part of Shandong. The Jingjiu passes through Liaocheng and Heze; the Jinghu passes through Dezhou, Jinan, Tai'an, Yanzhou (the Jinghu high-speed railway will through Qufu) and Zaozhuang. The Jiaoji Railway is an important railway of Shandong, linking its two largest cities of Qingdao and Jinan, with the longest history of all. There are also many shorter regional expressways within Shandong. The Shandong Peninsula, with its bays and harbours, has many important ports, including Qingdao, Yantai, Weihai, Rizhao, Dongying and Longkou. Many of these ports have historical significance as well, as the sites of former foreign naval bases or historical battles. Ferries link the cities on the north coast of the peninsula with the Liaodong Peninsula, further north across the sea. Important airports include Jinan Yaoqiang Airport and Qingdao Liuting International Airport. Other airports are Dongying Shengli Airport, Jining Qufu Airport, Linyi Shubuling Airport, Weifang Airport, Weihai Dashuibo Airport and Yantai Laishan International Airport. As of end of 2018, Qingdao is the only city in Shandong that has a metro system, with 4 lines in operation. Jinan will be operating its metro system in early 2019. Jinan, the capital city of Shandong since Ming dynasty, renowned for its 72 Famous Springs. Baotu Spring, a culturally significant artesian karst spring, declared as "Number One Spring under the Heaven" (天下第一泉) by the Qianlong Emperor of the Qing dynasty. Daming Lake, the largest lake in Jinan, whose water is from the springs of the area. Marco Polo described its beauty in his works. Thousand Buddha Mountain, renowned for its numerous Buddha images which have been carved out of the hill's rock faces or free-standing structures erect since the times of the Sui dynasty and its Xingguochan Temple. Lingyan Temple, one of the 4 most famous temples (四大名刹) in Tang dynasty, in which there are 11th century Pizhi Pagoda and the Thousand Buddha Hall which houses a Ming dynasty bronze Buddha statue as well as 40 painted clay statues of life-size luohan from the Song dynasty. remnant of Great Wall of Qi, the oldest existing Great Wall in China, which is built in 685 BCE and stretches from Jinan to Qingdao. Penglai, a town on the north of the Shandong peninsula famed in Taoism. Qingdao (a former German port city), is a beach resort city on the south of the peninsula that has German-era heritage architecture and is also famous for its Tsingtao beer. Ba Da Guan, made up of eight streets named after the eight great military forts of the ancient times. Zhan Qiao, a long strip pier stretches into the sea and was the first wharf at Qingdao. Laoshan, a scenic area and Daoist centre to the east of Qingdao. Qingzhou, an ancient trading and administrative centre with some famous archaeological discoveries. Weihai, a former British port city important in the second Sino-Japanese War has British-era heritage architecture. Weifang (潍坊) is a prefecture-level city in central Shandong province. It is made up of four urban districts (Kuiwen, Weicheng, Hanting and Fangzi) and Changle County, largely being urbanized. Weifang has numerous natural and historic sites, such as Shihu Garden (from the Late Ming and early Qing dynasty), Fangong Pavilion (from the Song dynasty), fossil sites (including dinosaur fossils, in Shanwang, Linqu), Mount Yi National Forest Park and Mount Qingyun. Yangjiabu are painted New Year woodcuts which is also famous all around China. ^ The data was collected by the Chinese General Social Survey (CGSS) of 2009 and by the Chinese Spiritual Life Survey (CSLS) of 2007, reported and assembled by Xiuhua Wang (2015) in order to confront the proportion of people identifying with two similar social structures: ① Christian churches, and ② the traditional Chinese religion of the lineage (i. e. people believing and worshipping ancestral deities often organised into lineage "churches" and ancestral shrines). Data for other religions with a significant presence in China (deity cults, Buddhism, Taoism, folk religious sects, Islam, et. al.) was not reported by Wang. The number of Muslims is taken from a survey reported in the year 2010. ^ "National Data of the National Bureau of Statistics of China on Major Figures of the 2016 Population Census  (No. 2)". ^ 山东省2017年国民经济和社会发展统计公报 [Statistical Communiqué of Shandong on the 2017 National Economic and Social Development] (in Chinese). Shandong Bureau of Statistics. 2018-02-27. Retrieved 2018-06-22. ^ a b Roberts, Edmund (1837). Embassy to the Eastern Courts of Cochin-China, Siam, and Muscat. New York: Harper & Brothers. pp. 122–123. ^ "CHINA: Basest War Lord"
^ Purchasing power parity (PPP) for Chinese yuan is estimate according to IMF WEO (October 2017) data; Exchange rate of CN￥ to US$ is according to State Administration of Foreign Exchange, published on China Statistical Yearbook. ^ "Average height in Yantai". 2015. Retrieved 2018-04-29. ^ "Confucius". Stanford Encyclopedia of Philosophy. Retrieved 7 December 2016. ^ "Confucius (551—479 B.C.E.)". IEP. Retrieved 7 December 2016. ^ 关羽. Baike Baidu. Retrieved 7 December 2016. ^ "Temple and Cemetery of Confucius and the Kong Family Mansion in Qufu". UNESCO. Retrieved 7 December 2016. ^ "The Confucian Temple, Cemetery and Family Mansion in Qufu". China.org. Retrieved 7 December 2016. Wikimedia Commons has media related to Shandong. 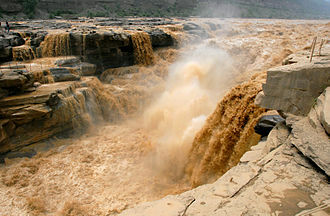 The Yellow River or Huang He is the second-longest river in Asia, following the Yangtze River, and the sixth-longest river system in the world at the estimated length of 5,464 km. Originating in the Bayan Har Mountains in Qinghai province of western China, it flows through nine provinces, the Yellow River basin has an east–west extent of about 1,900 kilometers and a north–south extent of about 1,100 km. Its total basin area is about 742,443 square kilometers and its basin was the birthplace of ancient Chinese civilization, and it was the most prosperous region in early Chinese history. Early Chinese literature including the Yu Gong or Tribute of Yu dating to the Warring States period refers to the Yellow River as simply 河, the first appearance of the name 黃河 is in the Book of Han written during the Eastern Han dynasty about the Western Han dynasty. The adjective yellow describes the color of the muddy water in the lower course of the river. One of its older Mongolian names was the Black River, because the river runs clear before it enters the Loess Plateau, in Mongolia itself, it is simply called the Šar Mörön. In Qinghai, the rivers Tibetan name is River of the Peacock above sea level they are the two largest plateau freshwater lakes nationwide, flowing east at the eastern edge of the Amne Machin Mountains, the Yellow River enters Maqu County in Gansu. Here, the river skirts through the peat bog known as the Zoigê Wetlands. Flowing now along the edge of Amne Machin, the river reenters Qinghai. The valley section stretches from Longyang Gorge in Qinghai to Qingtong Gorge in Gansu, steep cliffs line both sides of the river. The water bed is narrow and the drop is large, so the flow in this section is extremely turbulent. There are 20 gorges in this section, the most famous of these being the Longyang, Liujia, the flow conditions in this section makes it the best location for hydroelectric plants. The Yellow River exits Qinghai for the second and final time in these gorges, downstream from the Yanguo Gorge, the provincial capital of Lanzhou is built upon the Yellow Rivers banks. The Yellow River flows northeasterly out of Gansu and into Ningxia before the Qingtong Gorge, after emerging from the Qingtong Gorge, the river comes into a section of vast alluvial plains, the Yinchuan Plain and Hetao Plain. Qufu is a city in southwestern Shandong Province, near the eastern coast of China. It is located about 130 kilometres south of the provincial capital Jinan and 45 kilometres northeast of the seat at Jining. Qufu has an population of about 60,000. Qufu is best known as the hometown of Confucius, who is believed to have been born at nearby Mount Ni. The city contains numerous historic palaces and cemeteries, the three most famous cultural sites of the city, collectively known as San Kong, i. e. The Three Confucian, are the Temple of Confucius, the Cemetery of Confucius, these three sites have been listed as a UNESCO World Heritage Site since 1994. The name Qufu literally means crooked hill, and refers to a hill that was part of the city during its time as capital of the state of Lu. During the Shang, the area around Qufu was home to the people of Yan, along with Pugu and Xu, Yan joined the Shang prince Wu Geng and the Three Guards in their failed rebellion against the Duke of Zhou c. 1142 BC. After the rebels defeat, the Duke launched punitive campaigns against the Dongyi, forcing their submission, the territory of the Yan became part of the state of Lu, who made Qufu their capital throughout the Spring and Autumn period. This city had walls considerably larger than the present Ming-era fortifications, including land to the east. During the Tang Dynasty and the days of the Song Dynasty the city was centered around the present-day Temple of Duke Zhou. 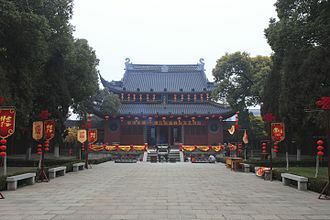 A temple in honor of the Yellow Emperor was built there, after the conquest of the northern China by the Jurchens, the new Jin Dynasty renamed Xianyuan back to Qufu, but the city stayed at its Song location. It was not until the reign of the Jiajing Emperor of the Ming Dynasty that the city wall was built. The site of the city in 1012-1522 is now Jiuxian Village, from that time up until the Yuan dynasty, there were two Duke Yanshengs, once in the north in Qufu and the other in the south at Quzhou. 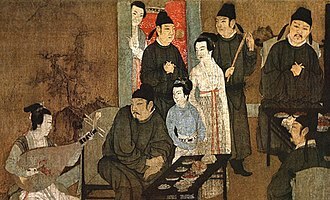 An invitation to come back to Qufu was extended to the southern Duke Yansheng Kong Zhu by the Yuan dynasty Emperor Kublai Khan. 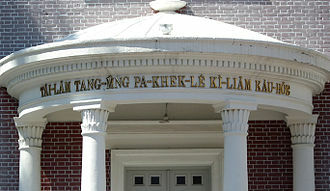 The title was taken away from the branch after Kong Zhu rejected the invitation. The southern branch still remained in Quzhou where they lived to this day, confuciuss descendants in Quzhou alone number 30,000. Confucius was a Chinese teacher, editor and philosopher of the Spring and Autumn period of Chinese history. 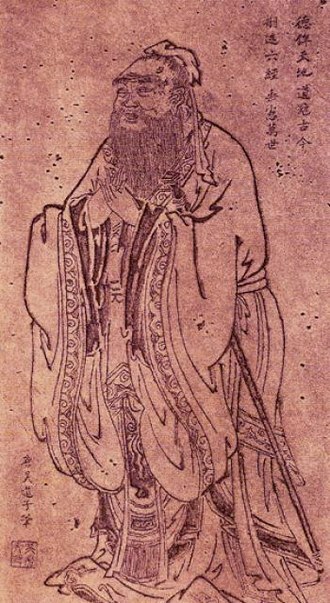 The philosophy of Confucius emphasized personal and governmental morality, correctness of social relationships and his followers competed successfully with many other schools during the Hundred Schools of Thought era only to be suppressed in favor of the Legalists during the Qin Dynasty. 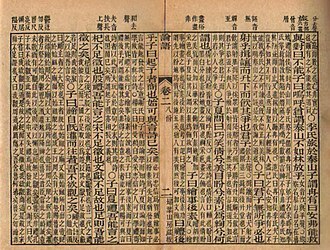 Following the victory of Han over Chu after the collapse of Qin, aphorisms concerning his teachings were compiled in the Analects, but only many years after his death. 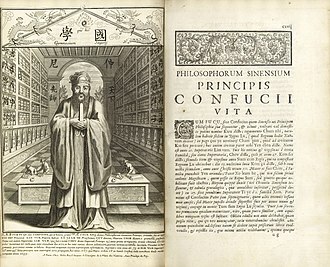 Confuciuss principles had a basis in common Chinese tradition and belief and he championed strong family loyalty, ancestor veneration, and respect of elders by their children and of husbands by their wives. He recommended family as a basis for ideal government and he espoused the well-known principle Do not do to others what you do not want done to yourself, the Golden Rule. Confucius is a deity in Daoism. According to tradition, three generations before Confucius time, his ancestors had migrated from the Song state to the Lu state, Confucius was a descendant of the Shang dynasty Kings through the Dukes of Song. Confucius family and personal name respectively was Kong Qiu, in Chinese, he is most often known as Kongzi. He is known by the honorific Kong Fuzi, in the Wade–Giles system of romanization, the honorific name is rendered as Kung Fu-tzu. The Latinized name Confucius is derived from Kong Fuzi, and was first coined by 16th-century Jesuit missionaries to China, within the Analects, he is often referred to simply as the Master. In 1 AD, Confucius was given his first posthumous name, in 1530, he was declared the Extremely Sage Departed Teacher. He is known separately as the Great Sage, First Teacher and it is generally thought that Confucius was born on September 28,551 BC. His birthplace was in Zou, Lu state and his father Kong He, known as Shuliang He, was an officer in the Lu military. Kong died when Confucius was three years old, and Confucius was raised by his mother Yan Zhengzai in poverty and his mother would die at less than 40 years of age. At age 19 he married his wife Qiguan, and a year the couple had their first child and Confucius would have two daughters together, one of whom is thought to have died early in her life as a child. 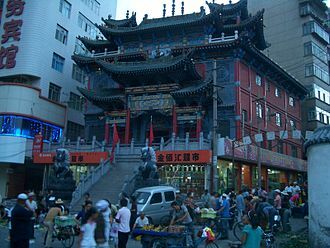 Entrance to Water Lily Street，a historical shopping street in Jinan. Historical plan of the Temple of Confucius (1912). Shui Yuet Temple in Shantung Street. A tailored dress in pink shantung, trimmed with black shantung, 1912.